Ekpoma is a town in Edo State, Nigeria. It is the administrative headquarters of the Esan West Local Government Area. 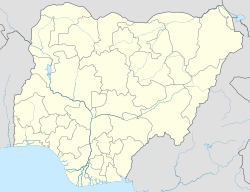 Ekpoma lies on the geographical coordinate of latitude 6°45′N 6°08′E﻿ / ﻿6.750°N 6.133°E﻿ / 6.750; 6.133. The town has an official Post Office, and it is home to the Ambrose Alli University. The people are mainly of Esan tribe, and are predominantly academic and non-academic staffs of Ambrose Alli University, owners of small scale medium enterprises (SME’s), subsistence farmers and others which include civil service, trading, transportation and students of Ambrose Alli University. The community enjoys a blend of traditional and orthodox medicine, with the presence of two general hospitals, a number of privately owned hospitals and Government owned health centers, and is also closely linked with Irrua Specialist Teaching Hospital, Irrua, where a lot of inhabitants visit to receive health care. Traditional bone setters, traditional birth attendants and herbal healers are also fairly distributed around the town setting. The caliber of staff commonly found at the health centers include community health extension workers, nurses, auxiliary nurses and doctors. Services offered at these centers include: health education, immunization, family planning counselling, treatment of minor ailments and first aid, referrals, and ante-natal. ^ "Post Offices- with map of LGA". NIPOST. Archived from the original on 2009-10-07. Retrieved 2009-10-20.